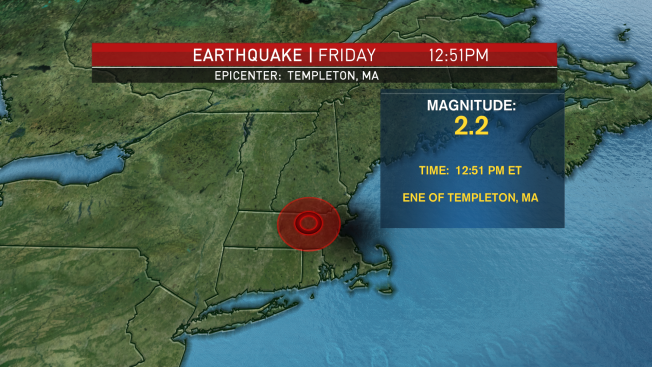 A magnitude 2.2 earthquake was reported in Templeton, Massachusetts at 12:51 p.m. on Friday, according to the Weston Observatory. The local Public Safety Communications Center in Gardner and communications centers in surrounding towns received citizen calls reporting shaking and associated loud noises. The Massachusetts Emergency Management Agency said it was aware of reports of shaking but there were no reports of explosions, fires or significant property damage. Ordinarily, a magnitude 2.0 earthquake will cause minor shaking but will not cause significant structural damage, MEMA said.